Spokane Falls Community College started in 1967 as part of Spokane Community College on property that was once Fort George Wright. In 1970, the Board of Trustees voted to create two separate, but cooperative colleges, and the Fort Wright campus was renamed Spokane Falls Community College. Max Snyder was the first president of the newly independent SFCC. Much of the campus was already in place by the time it became a separate college in 1970. There were eight buildings—administration/guidance counseling, library, gymnasium and classroom buildings for business, science, communications, fine arts, social science/humanities and physical/natural sciences. The campus continued to grow in the 1970s, when the student center and vocational arts building were completed, and the Lodge underwent a remodel. 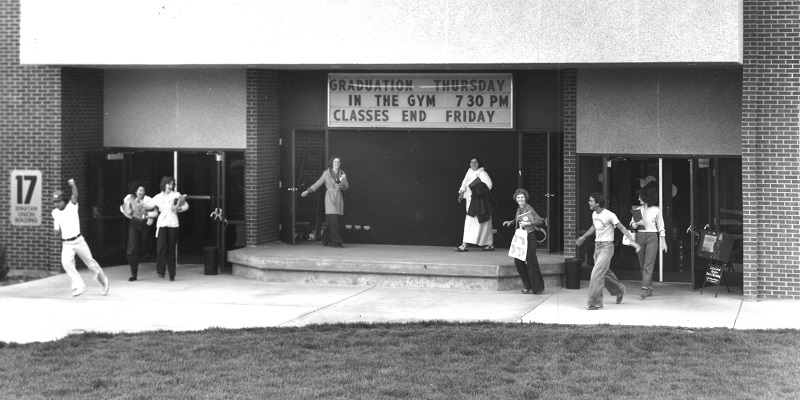 In 1985, SFCC opened a $1.5 million, 18,746-square-foot addition to the Student Union Building, including a complete student services center and an addition to the bookstore. Enrollment at SFCC continued to grow, with the number of students skyrocketing in the late 1980s and early 1990s. In 1992, Running Start began on campus, the program that allows juniors and seniors in high school to earn up to two years of college credit while completing high school requirements. Enrollment in the program was 191 in 1992. Now there are more than 750 Running Start students. Also in the 1990s, the Music Building saw a 3,656-square-foot expansion project, and the Science Building became the Math Science Building with a $5.7 million addition of 50,685 square feet. In April 2000, degree options for students expanded as trustees approved the addition of an associate of science direct transfer degree at SFCC and SCC. Two types of degrees would be offered - one covering the biological sciences, environmental/earth sciences, chemistry and geology, and the other covering engineering, computer science, physics, and atmospheric sciences. In 2011, a 70,000-square-foot science building was completed and cost about $30 million. The building included the planetarium, which was about $400,000, mostly from donors and fundraising by the CCS Foundation. In 2018, SFCC opened a newly renovated gymnasium and fitness center, an $18 million project funded completely by students.